The holiday concert in your school is great PR for the entire school! It shouldn’t be up to the music teacher to do all the organizing. time to rehearse songs and dances. When they have them learned, bring in the concert coordinator to help with entrances, exits and staging. Ask all staff members to prepare the children for the “what if’s” that can happen. If you are the music specialist, allow time to go through this with all children who will be in the concert. * “What if – you feel woozy?” (If you feel woozy when on stage, just sit down and put your head between your knees.) At least they won’t fall off the top riser! Program: One teacher or parent should take responsibility for printing the program and for handing it out at the door (or choosing students to do this) at the actual concert. Publicity: One teacher or parent should take responsibility for sending notes home giving the date, time and location of the concert. Supervision Backstage: The concert coordinator will be in the wings, coordinating entrances and exits. Two teachers or aides will be needed backstage to ensure that groups are ready to go on, on cue. All classroom teachers will be needed to supervise their children off stage. This is probably going to be the toughest hour of the school year. I had 90 children backstage one year. I played Concentration, Stella Ella Olla, and Topnotcher with them and managed to have fun while we waited. Directions for those 3 games are in “Singing Games Children Love” Volume 1 and 2, published by Themes & Variations. Videos don’t work well, unless you have a very large screen and a loud sound system. Taking children back to their own classroom and playing board games seems to be a good solution also. props are ready to be taken on stage from the wings. There are 2 things that parents hate at a Christmas concert – not being able to see their child, and not being able to hear what is being said and sung. Check and double check your sound system, and use risers so your students are all seen! parents, you might consider having a couple of students or the first class on stage read a poem at the beginning of the concert. In the Holiday Concert Scripts Collection the Concert Etiquette rap is given with two extra verses – one about babies crying and taking them out and one about parent paparazzi – parents who rush to the stage to photograph their child. 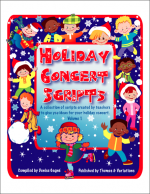 Holiday Concert Scripts – This is a collection of 14 scripts for holiday concerts written by teachers from all over Canada and the USA. It includes song suggestions, but you will find it very easy to use or substitute your own song choices. A PDF file of all the scripts will be available so you can easily cut and paste and create your own concert. Do you like to do an inclusive program? 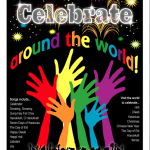 Celebrate Around the World includes a concert opener and a finale, a simple script, and 10 songs – Day of Eid, Diwali, a partner song using O Hanukkah, a partner song with Joy to the World, a great song about Snowing, Kwanzaa, and Gung Hay Fat Choi for Chinese New Years. This collection has beautiful vocals and orchestrations. You can use it in December — or ANY time of year! This entry was posted in Holiday Concerts on November 18, 2013 by Denise Gagne. Absolute lifesaver! You are a genius! I am a new teacher who is “being forced” to organize the spring concert. I really needed this! Genius! Enjoy the concert – it’s something that the kids remember for life!